The magazine LUXlife, is a bimonthly luxury lifestyle magazine that offers you a glimpse into the world of luxury. Spanning the highest net worth individuals from around the world, LUX Life readers are a special breed. They know what they like and are willing to pay for it. As such, the magazine displays the products, services, attractions and events that will appeal to them. Some of the world’s most internationally renowned brands, individuals and products are in our magazine so that our esteemed readers will find everything they need to truly live the life they deserve. The website, digital publication and diverse array of awards programs cover all aspects of high end lifestyle, including the finest, food and drink, hotels and resorts, health and beauty, automotive, jewelry, art and technology. Within the magazine, you will find everything from product news and reviews, to in-depth news, trends, features and comment, all designed to inform, entertain and inspire in equal measure. At LUXlife the magazine only showcases the best of the best, so you can rest assured that you are at the very cutting edge of the latest luxury trends and high-end developments. Every year the magazine recognizes excellence in the luxury travel industry worldwide with the annual Global Travel and Tourism Awards. 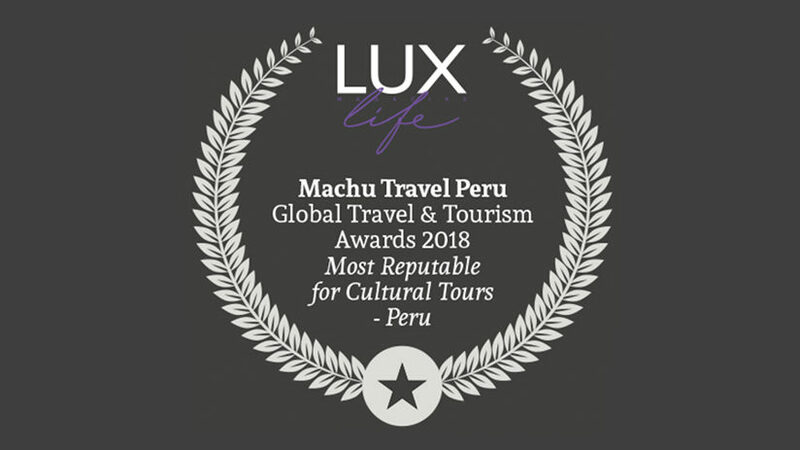 At this year’s awards, Machu Travel Peru was nominated and voted for “Most Reputable for Cultural tours” in Peru an honor that the company is humbled to receive. Machu Travel Peru initially started because of the need for good quality services in Peru. The company organizes high quality tours for their clients, as well as working with couples and groups who are looking to explore the wonderful sights of Peru. At Machu Travel Peru, we are able to deliver the best possible service to our clients by our extensive knowledge of Peru and providing services, which cater to the needs of our passengers and the mantra of our company. 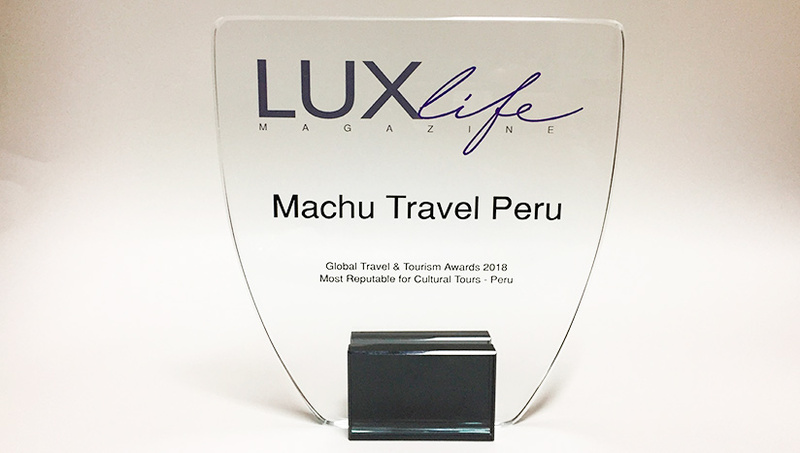 Looking ahead to what the future holds for Machu Travel Peru, the company has exciting plans for the future in the pipeline for LUXlife’s Most Reputable for Cultural Tours – Peru in the Global Travel & Tourism Awards 2018. Machu Travel Peru is always looking for new opportunities and new and exciting places to show our clients. We plan to expand into different markets and grow the company with more staff and different destinations. Machu Travel Peru are a local based, progressive company with an experienced team. Our customer reviews are exceptional, and we have many customers that recommend us to their family and friends. Moving forward, we look forward to a bright future in the years to come. 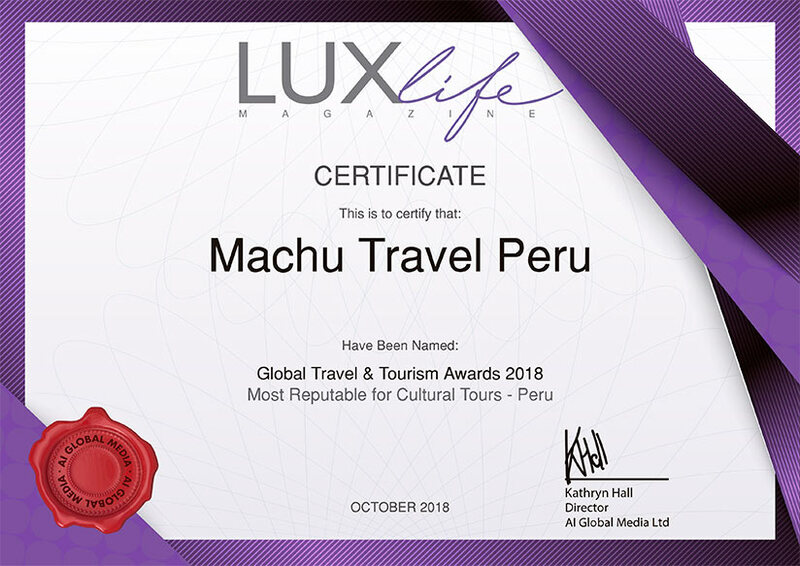 Machu Travel Peru would like to thank the team at LUXlife Magazine for their support and also thank our loyal clients who voted for us. To the future, Machu Travel Peru looks forward and they plan to improve their services and look for new and exciting products for the luxury traveler. Luxury Travel, Travel To Peru travel awards. permalink.